The other day, I received a phone call from someone wanting to do a survey. As you may recall, I'm usually pretty good about completing telephone surveys, much to the chagrin of my wife who'll no doubt be standing six feet away from me mouthing the words "who is it? Who is it? WHO IS IT?" until I either flip her off, leave the room, or just talk over the nice man calling from India but pretending he's calling from Markham, Ontario. The nice young man launched into his spiel, stating that he was calling from XYZ (a reputable survey company whose name I unfortunately cannot recall), and as I was motioning with my hands for him to move along and cut to the chase, because I was totally on board with this already -- he stipulated that he was looking for someone in the household BETWEEN THE AGES OF 19 - 29 about select products. I stood I my kitchen, mouth agape. I was shocked. Even if I'd wanted to participate, my OLD AGE disqualified me. I wanted to ask, "What KIND of products? I'm 34, but I'm hip! I can text message. I'm on Facebook! I know who Hannah Montana is!" Also, I learned today that I share a birthday the likes of Al Jaffee (cartoonist, Mad Magazine), Adam Clayton (bassist, U2), Neil Sedaka (duh), and Donald Duck (duck). Do I feel closer to international stardom and/or recognition because of this? Well, actually no. Not really. But hey, there's a little trivia for your Thursday. Bonne fete a toi! Happy birthday to you Mike! 34? OMG! You're still a b-a-y-b-e-e says this crone who's reaching on 40 sometime between now and next year! Can I offer you some snow for your birthday? We're getting a bit of a top-up from Mom Nature tonight. I guess she wants to tease us about being within 20 cm of the record snow fall amount that dates back to 1970. 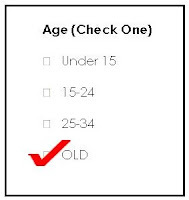 Moving up an age bracket on a survey is always disturbing. all the cool kids are born on the 13th. Hey! Happy birthday! I distinctly remember crossing over into that new demographic slot... I felt the same way. Ha. That reminds me of the time when I didn't "speak French well enough" to answer the survey about perfumes. Oh I was so mad. you could have always lied about your age... you have to start sometime. This is still your Birthday Week, by the way, so I am Not.Late. Yeah, 34. It's sooo ollllld! *cough* It only gets better, baby. Just remember that. I hope you had a wonderful and memorable day! Poor old Mike. Nobody cares to hear the opinions of the elderly. Happy birthday, sorry I go this soooooo late. You know who Hannah Montana is and you can text message. That is the funniest thing I read all day! But don't feel bad. I am only 28 and my young kids already think I'm old and don't know anything! Too funny. Thanks! "I can text message. I'm on Facebook! I know who Hannah Montana is!" Sadly, I only know who Hannah Montana is on the periphery. I can't even claim that! I almost bought Hello Kitty paraphernalia last week just to prove a point. I'm no longer sure what that point was.